Don’t miss the latest items we have for sale. Sign up for the First Dibs Club and we’ll keep you updated on what’s for sale. Shop now. Pay monthly. No credit needed. Progressive’s Leasing lease-to-own option lets you pay monthly for the items you want today. We get new furniture every day. You’ll be surprised to see what has come in since the last time you looked. Tired of looking at that furniture that just doesn’t work with your current designs? We make it easy to turn it into money. Consign with us. 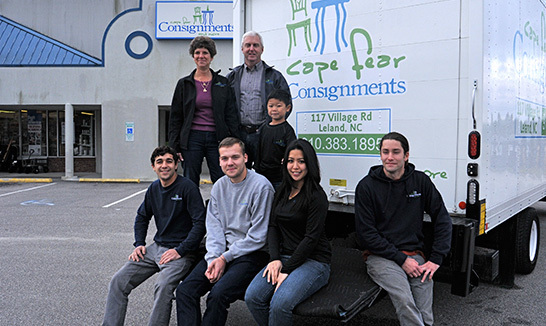 If you are moving, downsizing, or simply making some design changes in your home, consigning your unneeded items with Cape Fear Consignments & More is the way to go. Our expertise in home design and home staging creates an atmosphere to SELL! lamps and some furniture items to give you the option of choosing new furniture at the prices you expect from Cape Fear Consignment & More. If you are looking to consign or buy new or used furniture, accessories, or eclectic accents, Cape Fear Consignments & More is the place for you. Our front and back showrooms make us the largest consignment marketplace in North Brunswick County! And unlike other consignment shops, our 6,000-square foot space is staged like an upscale furniture boutique. Our expertise in home design guarantees your merchandise will be displayed to its fullest potential! If you’re interested in consigning with us, learn How To Consign. We have consignors from Hampstead to Calabash, including Wilmington, Leland, Winnabow, Wilmington, Bolivia, Southport and Oak Island.